Brian Cowen is 'excited by the challenge but daunted by the responsibility' of becoming Taoiseach and leader of Fianna Fáil. At his first news conference since being elected leader-designate of the party, Mr Cowen said his election was the highlight of his political career to date. Brian Cowen was elected unopposed as the seventh leader of Fianna Fáil at a special meeting of the parliamentary party this morning. This afternoon, he said he would devote all his abilities and all his energies to the task before him. Mr Cowen said today was a proud day for his wife Mary, two daughters, mother May and his wider family. Asked whether he supports the HSE and Minister for Health Mary Harney, he said he does and claimed opponents of Government health policy are attempting to retain the status quo, which he said was not an option. Mr Cowen said there are improvements happening in our health service while there are also perennial structural problems. He said it has been agreed in principle to deconstruct and reconstruct the public service and put the citizen at the centre. He said the health forum is the means by which we should do it, and we should give urgency to that work now. The next Fianna Fáil leader reaffirmed his commitment to mutual respect and equality on the island. Mr Cowen said he is deeply committed to continuing the Government's involvement in the Northern Ireland. Asked about the potential for Sinn Féin in Government, he said this could only be considered in a given set of circumstances. 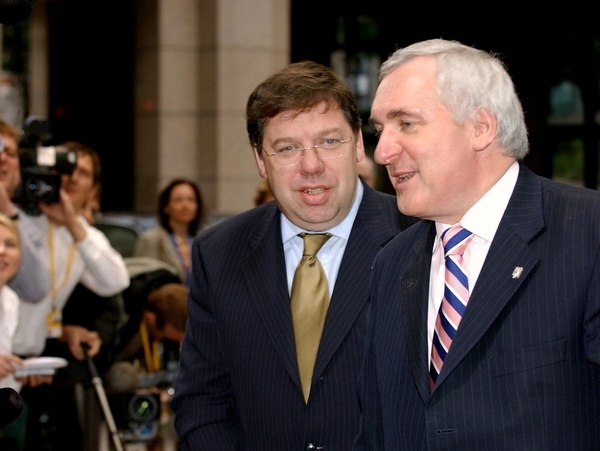 He also stressed the importance of the Lisbon Treaty for the country. He said all of Europe is looking to us and there is huge responsibility on all of the political parties, who need to get out and campaign for it. He said he would bring his own style to the job of Taoiseach. Mr Cowen said Bertie Ahern lived the position 'day and night', and had a huge work ethic which Mr Cowen said he hopes to match. And he said he would be fully aware of his accountability to the public. On the question of what he intended to re-shape on a personal level, Mr Cowen said he was very conscious of the fact that taking on the role of Taoiseach brings huge responsibilities and he has to make sure that he holds that office with the required dignity and decorum. By the same token he said in moments of leisure he would relax and socialise and 'not do anything criminal'. Mr Cowen said the fundementals of the economy are still good even though we are clearly in more challenging times and the one thing we will not do at this phase of the economic cycle is retreat on our capital investment. Asked about continued growth in day-to-day governmnet spending, he repeated his belief that we need to borrow modestly in order to invest ambitiously. He said we are not immune to international trends but we will still do better than others. It took less than 20 minutes to formally elect Mr Cowen this morning - his was the only name in contention at this morning's Fianna Fáil parliamentary party meeting. The leader-designate thanked his colleagues for the honour they had conferred on him before taking part in a photocall outside Leinster House. Mr Cowen then took his usual place beside the Taoiseach in the Dáil chamber for Leaders' Questions, he will be taking over that particular hot seat in four weeks' time. The Tánaiste has already indicated he will not be talking about policy issues until he takes over as Taoiseach on 7 May, nor will he be drawn on the shape of his new Cabinet. There was only ever going to be one outcome to the succession to Bertie Ahern. 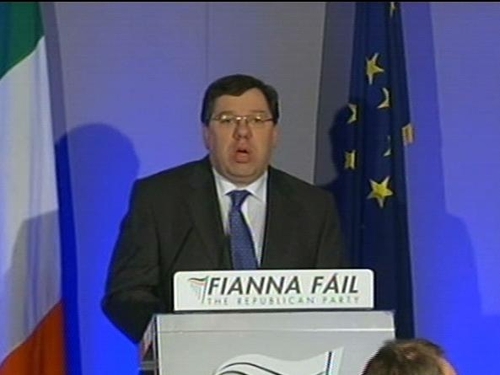 As Tánaiste, Finance Minister and Deputy Leader of Fianna Fáil, Brian Cowen was always in pole position. His backing was so strong from the off that no potential rival put their name forward for today's special meeting of the Parliamentary Party, and Mr Cowen, like Bertie Ahern, was elected unopposed.